What do oil production, agriculture, and breast cancer all have in common? Watch our free webinar to find out! 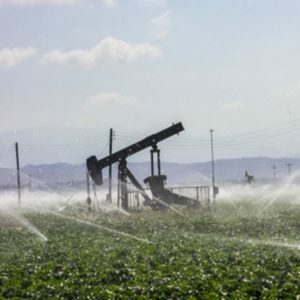 Last year, our Think Before You Pink® campaign called out the practice of using oil wastewater to irrigate crops. We had a win when our target Bee Sweet Citrus stopped pinkwashing their products. Yet many agricultural companies continue to use oil wastewater to grow our food. On this free webinar, acclaimed ecologist and anti-fracking activist Dr. Sandra Steingraber outlines the process of oil wastewater production including chemicals of concern, and explains the health risks associated with oil wastewater use in agriculture. Sandra is joined by Breast Cancer Action’s Executive Director, Karuna Jaggar who speaks about the breast cancer-specific risks of oil wastewater and what YOU can do to protect our health.